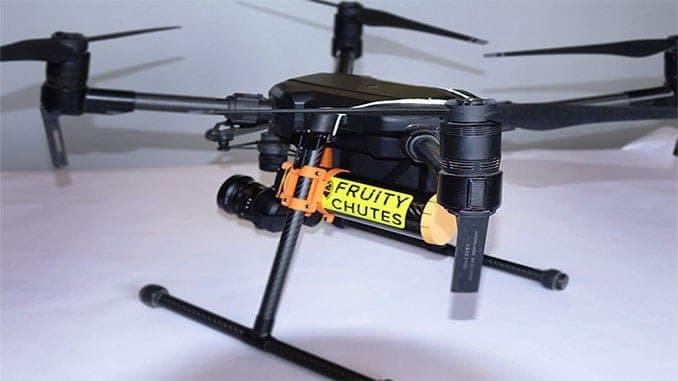 Unmanned Systems Source, an online supplier of unmanned parts, components, and systems has announced the availability of Fruity Chutes’ new Automatic Emergency Drone Parachute for DJI’s Matrice 200 and Matrice 210 drones. The system is lightweight and easy to use, and can be packed and loaded by the user, eliminating the need to send it back to the manufacturer after use. A Harrier parachute launcher is included, which features a high energy compression spring that ejects the parachute out and away from the Matrice 200/210 quickly. The launcher has no regulatory or transportation limitations so users can take the Matrice 200/210 with parachute system anywhere. The centerpiece of the parachute system is the Fruity Chutes Iris Ultra Light Chute which weighs 4.8oz (135g). The parachute has a nominal rating of 13.6 lbs (6.2Kg) @ 15 feet per second (4.6Mps) descent rate after deployment, providing a gentle landing. The parachute can easily work at heavier load weights of 10Kg or more, allowing the use of optional heavier cameras or batteries without worry. The parachute system is entirely self-contained, and not reliant on the Matrice 200/210 power, so it works even if the drone’s battery has a complete failure. The automatic trigger system (ATS) can detect if the drone suddenly falls, rolls, or flips. Detection of a fall typically takes just 0.75 seconds, or about 16 feet of free fall. By the time the pilot notices a problem, the parachute will already be ejected. To make setting up faster a quick start guide is supplied with resource links to online tutorials and help resources. QR codes are also provided to make navigation to help resources a smartphone click away.